To create a page, from the main menu, select New -> Page OR alternately select Edit -> Pages and click New in the section New on the left. There are eight sections for defining and viewing the different properties of a new page. Each section is explained in detail below. In the Edit Content mode there is also a tabbed menu at the bottom of the page for quick and easy access to basic functions. Please note that some buttons/functions are displayed only after the page has been created and saved, and some only after publication of the page. We will take a look at these in the second part of each section, the changes will be marked accordingly. Enter the text for the title bar of your new page. Clicking Select Page... allows you to copy content from existing pages. You can choose which language the page should be translated to (from the available languages) and set relations between the original page and the localized copies. Select a navigation node that will use your new page as standard. Clicking on this navigation will open this page. Having already defined your page as standard page for a navigation item, you can ignore this point. If you do not want to define the page as standard page for any navigation item, but you want to link the page by a text or image link in the content area of a page, then here you have the possibility to select a navigation item to be highlighted by the new page. Assign a category to your new page. Allows you to create and manage tasks related to this page. Allows you to view and edit all links used on the page. Here you can see the rights for this page. Assign meta tags to your new page. 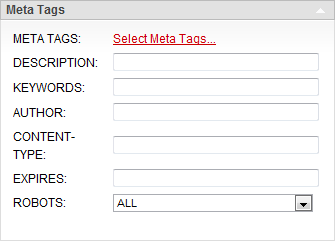 You can select a predefined meta tag group or enter individual meta tags. You can preview the standard and print view of your page in MS and LS. Please note that new unsaved page does not yet have a preview option, thus this section is empty. Here you can enter terms that you want the index search to find the page by. These terms are independent of the terms in document content. You can enter text here. These texts can be used in the context of the pages. These are by default without function. 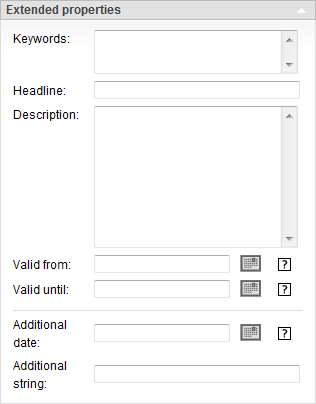 These fields can be used to specify the time when the page will be accessible. There fields are by default without function. In the left column there is the Tools section. Saves the page and takes you to the Pages Overview page. Saves the page and reloads the Pages Detail page. Takes you back to the Pages Overview page. No changes will be saved. Opens a new Pages Detail page for creating a new page. When you click this button, the content editor for this page is opened (same as opening the Edit tab in the tabbed menu at the bottom of the page). Returns the page to unpublished state. Requests publishing for the page. Here you can manage the dependencies of the page. Clones the entire page with all its content. Deletes the page. If the page was published before, Delete only marks it for deletion. To remove it completely, the page has to be published. Approves the page. The page can be edited further. Revokes the approved state of the page. This section lists approvals needed for this page. This section is only visible if the user has controller rights for this page. In this section you can set up relations of your page to other pages, members, documents, etc. 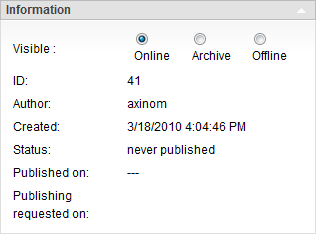 Starting from AxCMS.net version 8.6 and later, it is possible to clone entire pages with all the content on them. 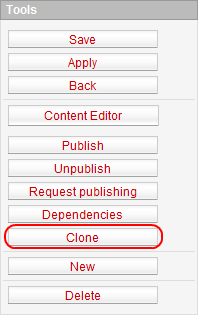 To clone a page, go to Edit -> Pages and click the Edit icon next to the page you want to clone. On the detail page, click on the Clone button in the Tools section on the left. A new popup opens. Here you can select a site the page is to be cloned to (this is optional). If you do not want to clone the page to an existing site, click the button Next in the popup. Click ... to manually attach a navigation to the cloned page. Click ... to manually add relations to the cloned page. Click ... to manually attach categories to the cloned page. 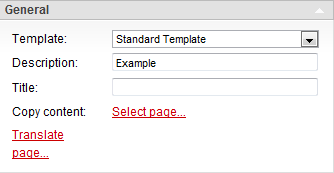 When this checkbox is selected, the system copies navigation of the cloned page from the source page. 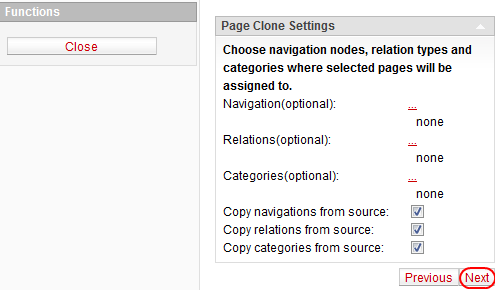 When this checkbox is selected, the system copies relations from the source page to the cloned page. When this checkbox is selected, the system copies categories to the cloned page from the source page. Buttons that allow you to go one step back of forward in the cloning page popup. The name of the source page. Enter the name of the new page being cloned. By default the system gives each cloned page a name in the format [source page name]_copy. Click the Finish button. The cloned page is successfully created and a corresponding message is displayed. To close the popup, click on the Close button on the left. XML containing the raw data of the page. The created XML data is loaded to a new popup. You can copy the data from this popup to a file. XML containing all the data of the page including content. As with the Raw XML format, the XML data of the page are loaded to a new popup. The page data is loaded into a created CSV file. You can save the file to a desired location. To export a page, go to the Page Overview page (Edit -> Pages) and select the checkbox near the desired page in the list of pages. Select the needed file format from the dropdown list in the Export section on the left. When the export format is selected, click the Export button.